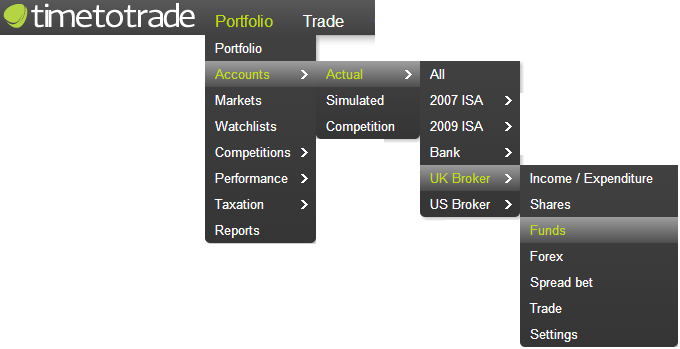 The Portfolio Accounts can be used to track unit trust fund investments in multiple currencies. In this section we will discuss how to add, edit and delete fund transactions in your Portfolio Account. 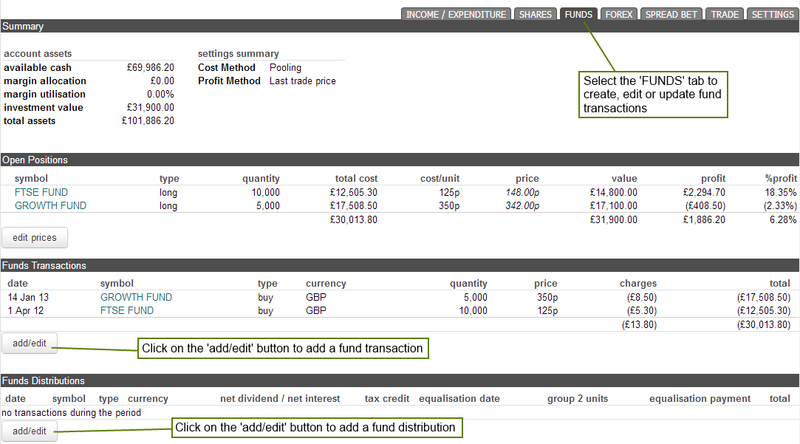 You can now enter the fund transaction details in the fields as illustrated in the following screen shot example. Currency: Use the currency drop down menu to set the transaction currency. It is possible to have multiple transactions in your open positions with varying currencies. Quantity: Input the number of funds purchased / sold. The system supports fractional fund holdings. Price: Input the purchase or sale price of the fund. Please note that the price associated with a UK fund and related transactions should be entered in pence (GBX); charges should be entered in pounds (GBP). For US Dollar and Euro transactions all fields should be entered in Dollars and Euro respectively. Total: This field can be left blank if the quantity, price and charges fields have values; in this case the total transaction value will be calculated. Alternatively the value can be overwritten. To save the transaction, click on the 'add' button. Once you have finished adding your fund transactions to the account, click on the "done" button as illustrated above.